Bollywood's outspoken actress Kangana Ranaut never fears speaking her mind and she very seldom shies away from presenting her stance on her contemporaries. Recently, the 'Queen' starlet was in the headlines for her views about Alia Bhatt's performance in Ranveer Singh starrer 'Gully Boy', which she deemed as 'mediocre'. This was when an interviewer compared Kangana's performance in 'Manikarnika' to Alia's in 'Gully Boy'. Responding to this, Kangana said, "I am embarrassed...What is there to beat in Gully Boy Performance ....same snappy muh phat girl... Bollywood’s idea of a fiery girl, woman empowerment and good acting, spare me this embarrassment, please. Media has taken filmy kids love too far...stop pampering mediocre work or else bar will never be raised." 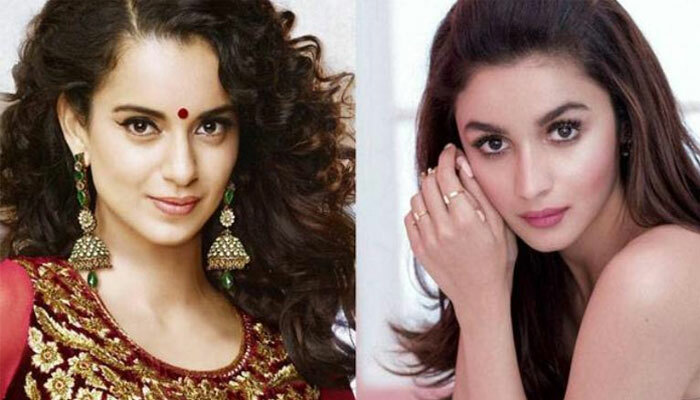 Almost two weeks after Kangana's statement, Alia Bhatt has come forth giving her two cents on the matter. On the work front, Alia Bhatt is in the midst of promotions of her upcoming film 'Kalank' in which she stars alongside Varun Dhawan, Sonakshi Sinha, Aditya Roy Kapoor, Madhuri Dixit and Sanjay Dutt. The film will be releasing on April 17 and is a much awaited film of the year.